The crowd is going to see you coming like never before when you slowly step out of your ride and see your mens red alligator texture dress shoes with the cap toe by Giorgio Brutini. The Davy is hybrid design featuring an alligator texture that just says style in the way Giorgio Brutini is famous for. 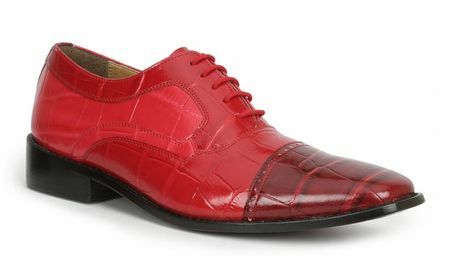 You'll make a boring suit pop when you're wearing these mens red dress shoes by Giorgio Brutini.